You need to fix this Mirillis. Please man your software is the best as it supports so many codecs and different recording modes but this issue has been their since when. The audio in the program is somehow messed up. I hope this info helps and please release a patch or something Thnx!! Last edited by VexMex on Sun Feb 01, 2015 11:56 am, edited 3 times in total. Is there any progress? I have not been able to use action for months. The audio track for "system sounds" seems to speed up during the recording which causes the system sounds and the microphone to go out of sync. When I play back the video, at first, everything is synchronized, but after a while the system sounds are coming in to early. This happens about 5 minutes in, in the video. 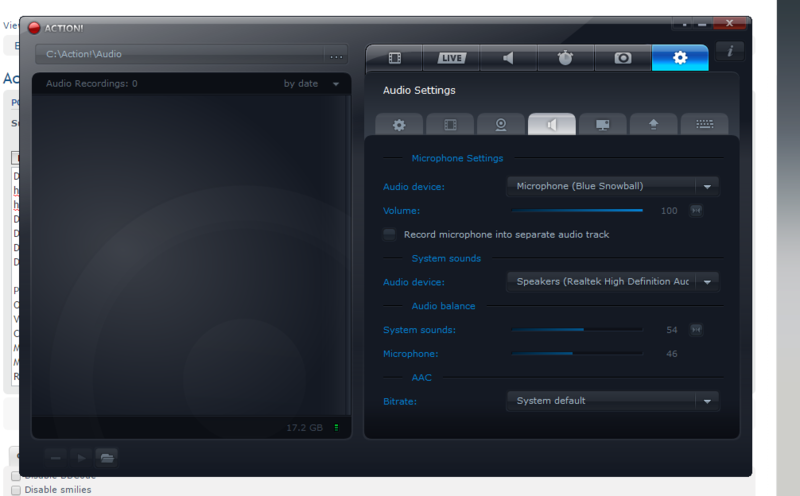 Turn off "record microphone into separate track"
None of these tries have made any changes to the problem unfortunately. 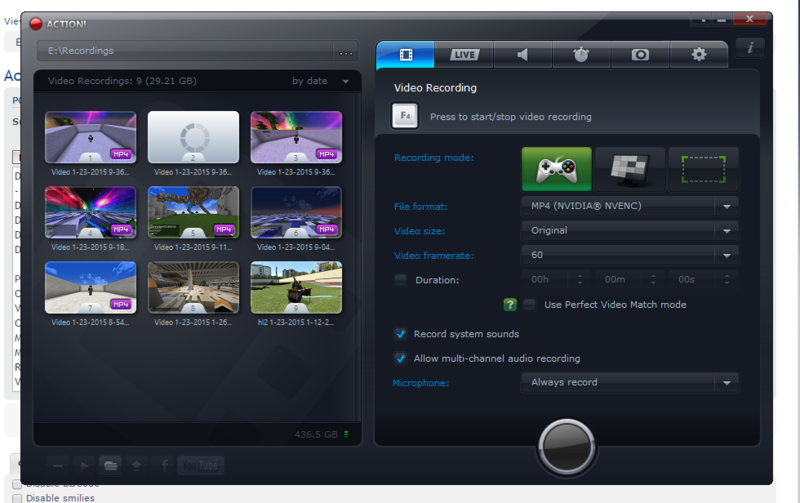 Ok, so I switched to Camtasia Studio 8 and it worked perfectly. Here is what we have investigated so far. NVENC and AMD APP encoding technology cannot handle smooth 60 fps recording in constant frame rate which causes the video to speed up. Lower resolution or changing fps to 30 usually helps. It's not really an Action! issue, but the current technology offered by Nvidia and Amd. We were not able to reproduce any similar issues with Intel Quick Sync technology. Probably switching to variable frame rate will help in most cases that were reported here. Our devs are currently working on this feature. Thank you for your patience and sorry for all the inconvenience that this issue may cause. This is still an open issue until new release will be provided and we can see a high rate improvement rate on our users side. And for me it happens with AVI and with Intel Quick Sync too. I know that it only happens with Dragon Age Inquisition, but... something it's wrong with Action recording mode. Shadowplay is a dedicated Nvidia software that have unlimited access to their graphic card resources. They can adjust their drivers to provide any kind of performance for their own software. Sadly, third party developers does not have all the advantages. Okay so this issue went away for the MP4 option not the amd app version. 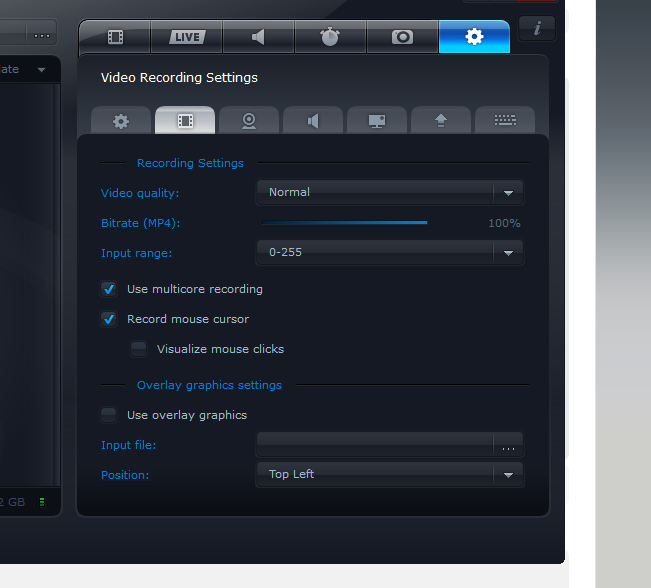 But I add to disable my mic being recorded in a second audio track.